It's a slow process - getting through these exquisitely rugged peaks. The section I'm on now, between NH 16 in Pinkham Notch and US 2 east of Gorham, is a section that is very popular for fit thru-hikers to slackpack through in a single day. I thought about doing my version of this: two yo-yo day-hikes from either end, taking two days to complete the section. But sanity prevailed. I'm nowhere near as fast as the 20-something thru-hikers. And with trail this gruesome, I'd surely have to take a zero between the two tough days, and perhaps another after the second. So it seemed wiser to tackle this section in four hikes, two of which would include 7 to 8 miles of side-trail hiking on top of the AT mileage. But all four days would be within my comfort zone rather than extending myself and wearing out my 'old-man' knees, ankles and feet. So today was the second of these four. 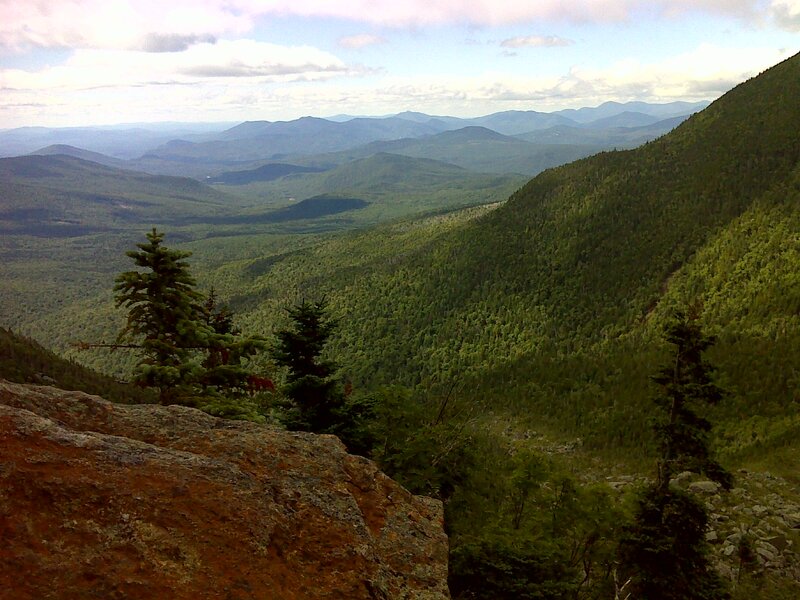 I hiked up Nineteen Mile Brook trail (3.6 miles each way, 1800 feet vertical), intersected the AT, scrambled 1500 more feet up the precipitous north wall of Carter Notch to Carter Dome, and then trundled on over Mt. Hight and South Carter to a turn-around point at the summit of Middle Carter. 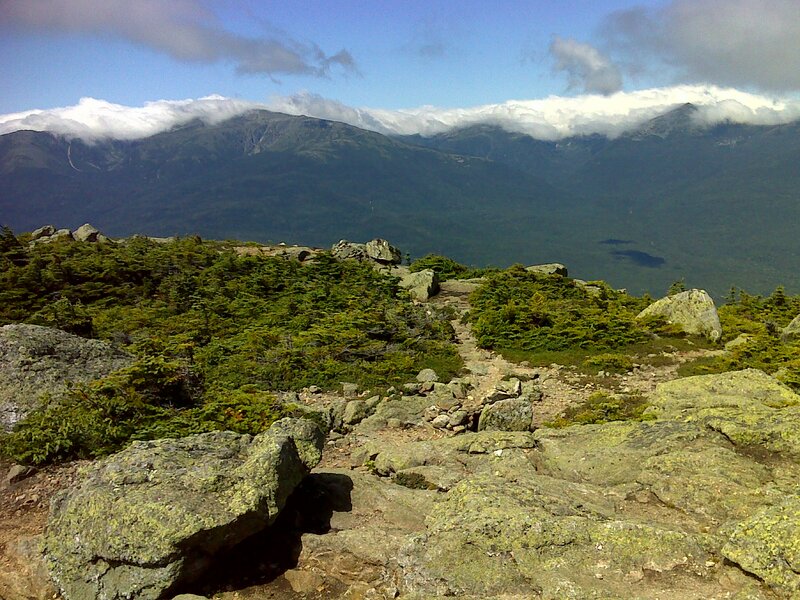 This was a tough day, and it began in lousy weather - humid and sweaty on the ascent, then lots of wind and fog on the summits, chilling me in my sweaty clothes. The wind never let up as the day progressed, but the fog lifted and the air dried out. Then the visibility was superb. In the end it was an exhausting but spectacular day. 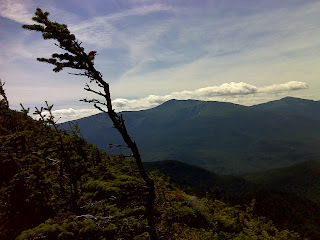 My favorite view was of the wind-driven clouds clinging to the Presidential Range, as taken from the exposed summit of Mt. Hight. It was so windy there that I couldn't stand up - had to sit and brace myself to take this photo. Third favorite - an afternoon view of Mt. Washington, finally in the clear, taken from the little viewpoint just north of the summit of Carter Dome. The descent back down the face of Carter Notch from Carter Dome was unexpectedly easy. There were always good flat spots to land my feet. It's those sketchy sloped bedrock sections with nothing but random roots to the side or little cracks and knobs in the slippery bedrock as landing-points that slow me down when descending. None of those here. Still, I got back 'home' late and very exhausted. I had pushed to make extra distance today while the weather was favorable. The forecast is unsettled for the coming days. So I had deliberately over-extended myself. Once I was back 'home' all I could do was sit in a heap. I was so tired I wanted to cry. But after vegging-out for half an hour, I began to feel human again. And it was worth it. I had put myself in a position such that tomorrow should be a shorter, easier day by comparison - if the weather cooperates. If not, tomorrow will be yet another zero ... and another very welcome one.